McKNEALLY, Martin Boswell, a Representative from New York; born in Newburgh, Orange County, N.Y., December 31, 1914; educated in Newburgh public schools; A.B., Holy Cross College, 1936; LL.B., Fordham University Law School, 1940; enlisted in the United States Army, March 17, 1941, as private and discharged as major; practiced law in Newburgh and New York City; president, board of education, Newburgh School District; State commander, American Legion, 1956-1957, national commander, 1959-1960; appointed to New York State Defense Council by Gov. Nelson A. Rockefeller; special counsel to Lt. Gov. 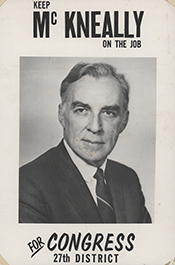 Malcolm Wilson of New York; elected as a Republican to the Ninety-first Congress (January 3, 1969-January 3, 1971); unsuccessful candidate for reelection in 1970 to the Ninety-second Congress; was a resident of Newburgh, N.Y., until his death on June 14, 1992.